Dr. Lauren Bellaera is the Director of Research and Impact at The Brilliant Club, a charity that aims to increase the number of pupils from under-represented backgrounds who progress to highly-selective universities. She is responsible for evaluating the impact of the charity’s programmes on pupil outcomes. You can find The Brilliant Club on Twitter @BrilliantClub. Lauren has recently been appointed as a part-time Associate Lecturer at Birkbeck, University of London. Lauren has also worked at the University of Cambridge, UK. In this role she evaluated the impact of a set of online educational resources on university students’ conceptual understanding and critical thinking skills. Lauren trained as a cognitive psychologist, and she has worked with a number of educational organizations including IGGY and Macat. “[the] purposeful, self-regulatory judgment which results in interpretation, analysis, evaluation, and inference, as well as explanation of the evidential, conceptual, methodological, criteriological, or contextual considerations upon which judgment is based” (1, p. 3). Despite the different definitions, there is a consensus regarding the dimensions of critical thinking and these dimensions have implications for how critical thinking is understood and taught. Critical thinking includes skills and dispositions (1). The former refers to reasoning and logical thinking, e.g., analysis, evaluation, and interpretation, whereas the latter refers to the tendency to do something, e.g., being open-minded (2). This blog post primarily is referring to the development of critical thinking skills as opposed to dispositions. Critical thinking can be subject-specific or general, and thus can either be embedded within a specific subject or it can be developed independently of subject knowledge – something that we will revisit later. How are Critical Thinking Skills Developed? Developing critical thinking is often regarded as the cornerstone of higher education, but the reality is that many educational institutions are failing to develop critical thinking consistently and reliably in their students, with only around 6% of university graduates considered proficient (3), (4), (5). The important question at hand here is: Are some types of critical thinking more difficult to develop than others? The short answer is yes - subject-specific critical thinking appears to be easier to develop than general critical thinking. Studies have shown that critical thinking interventions improve subject-specific as opposed to general critical thinking (7), (8). This is also what we have found in our own research (9). Possible reasons for why this is the case include the fact that the length of time needed to develop general critical thinking is much greater. This is coupled with the idea that general critical thinking is simply not as malleable as subject-specific critical thinking (10). For balance, though, some studies have reported improvements in general critical thinking indicating that under the right circumstances, general improvement is possible (6), (11). The key message here is that background knowledge is an important part of teaching critical thinking and the extent to which you aim to develop critical thinking beyond the scope of the course content should be assessed dependent on what is achievable in the given context. The general approach explicitly teaches critical thinking as a separate course outside of a specific subject. Content can be used to structure examples and activities but it is not related to subject-specific knowledge and tends to be about everyday events. The infusion approach explicitly teaches both subject content and general critical thinking skills, where the critical thinking instruction is taught in the context of a specific subject. Similarly, the immersion approach also teaches critical thinking within a specific subject, but it is taught implicitly as opposed to explicitly. This approach infers that critical thinking will be a consequence of interacting with and learning about the subject matter. Lastly, the mixed approach is an amalgamation of the above three approaches where critical thinking is taught as a general subject alongside either the infusion or immersion approach in the context of a specific subject. In terms of which are the best instructional approaches to adopt, evidence from a meta-analysis of over 100 studies showed that explicit approaches led to the greatest increase in critical thinking compared to implicit approaches. Specifically, the mixed approach where critical thinking was taught explicitly as a separate strand and within a specific subject was the most effective, whereas the implicit immersion approach was the least effective. This research suggests that developing critical thinking skills separately and then applying them to subject content explicitly works best (14). Both answering and generating higher-order thinking questions have been shown to increase critical thinking (8) (14). For example, psychology students that were given higher-order thinking questions compared to lower-order thinking questions significantly improved their subject-specific critical thinking (8). Alison King’s work on higher-order questions provides some useful examples of question stems (15). Ensuring that critical thinking is anchored in authentic instruction that allows students to engage with problems that make sense to them, and that enables further inquiry is important (6). Some ways to facilitate authentic instruction include simulations and applied problem solving. Closely related to higher-order questions and authentic instruction is dialogue – essentially discussions are needed to develop critical thinking. Teachers asking questions is particularly beneficial to the development of critical thinking, in part, because teachers will often be asking questions that require higher-order thinking. A meta-analysis study showed that authentic instruction and dialogue were particularly effective for developing general critical thinking (6). Engaging pupils in explicit self-reflection techniques promotes critical thinking. For example, asking students to judge their performance on a paper can increase their ability to understand where they need to improve and develop in the future (16). Other formalisations of this include reflection journals (17). In my current role, we also employ self-reflection activities to increase critical thinking. So, to conclude, remember when developing critical thinking skills that context is king, always be explicit and always be strategic! (1) Facione, P. (1990). Critical thinking: A statement of expert consensus for purposes of educational assessment and instruction (The Delphi Report). (2) Ennis, R. H. (1996). Critical thinking. Upper-Saddle River, NJ: Prentice Hall. (3) American Association of Colleges and Universities (2005). Liberal education outcomes: Preliminary report on student achievement in college. Washington, DC: AAC&U. (4) Dunne, G. (2015). Beyond critical thinking to critical being: Criticality in higher education and life. International Journal of Educational Research, 71, 86-99. (5) Ku, K. Y. (2009). Assessing students’ critical thinking performance: Urging for measurements using multi-response format. Thinking Skills and Creativity, 4, 70- 76. (6) Abrami, P. C., Bernard, R. M., Borokhovski, E., Waddington, D. I., Wade, C. A., & Persson, T. (2015). 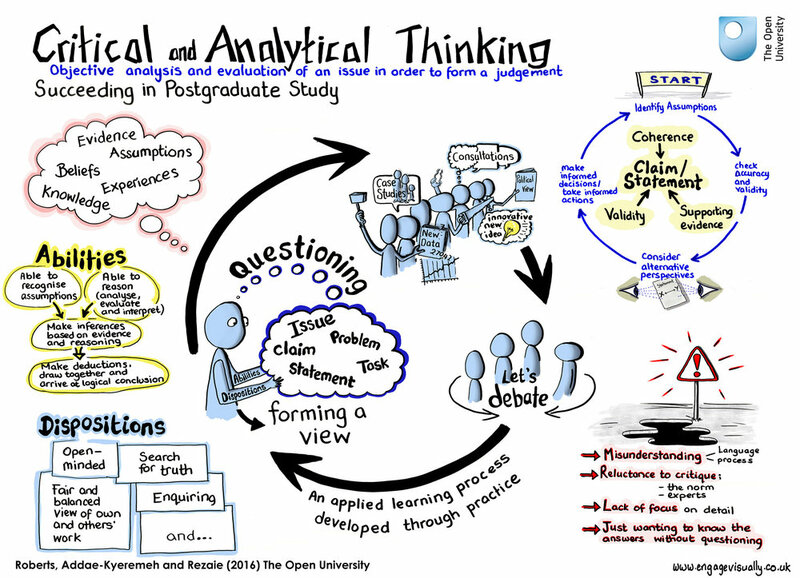 Strategies for teaching students to think critically: a meta-analysis. Review of Educational Research, 85, 275-314. (7) Williams, R. L., Oliver, R., & Stockdale, S. (2004). Psychological versus academic critical thinking as predictors and outcome measures in a large undergraduate human development course. The Journal of General Education, 53, 37-58. (8) Renaud, R. D., & Murray, H. G. (2008). A comparison of a subject-specific and a general measure of critical thinking. Thinking Skills and Creativity, 3, 85-93. (9) Bellaera, L., Debney, L., & Baker, S. (In press). An intervention for subject comprehension and critical thinking in mixed academic ability university students. The Journal of General Education. (10) Facione, P. A., Facione, N. C, & Giancarlo, C. A. (2000). The disposition toward critical thinking: Its character, measurement, and relationship to critical thinking skill. Informal Logic, 20, 61-84. (11) Halpern, D. F. (2001) Assessing the effectiveness of critical thinking instruction. The Journal of General Education, 50, 270–286. (12) Lai, E. R. (2011). Critical thinking: A literature review. Pearson's Research Reports, 6, 1-49. (13) Ennis, R. H. (1989). Critical thinking and subject specificity: Clarification and needed research. Educational Researcher, 18, 4-10. (14) Abrami, P. C., Bernard, R. M., Borokhovski, E., Wade, A., Surkes, M. A., Tamim, R., & Zhang, D. (2008). Instructional interventions affecting critical thinking skills and dispositions: A stage 1 meta-analysis. Review of Educational Research, 78, 1102-1134. (15) King, A. (1995). Designing the instructional process to enhance critical thinking across the curriculum. Teaching of Psychology, 22, 13-17. (16) Austin, Z., Gregory, P. A., & Chiu, S. (2008). Use of reflection-in-action and self-assessment to promote critical thinking among pharmacy students. American Journal of Pharmaceutical education, 72, 1-8. (17) Mannion, J., & Mercer, N. (2016). Learning to learn: Improving attainment, closing the gap at Key Stage 3. The Curriculum Journal, 27, 246-271.